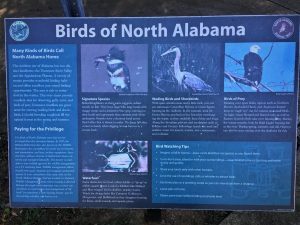 I issued the core of this Great Blue Heron Blog Post October 24, 2018. Its text, photos, reflections, and ruminations are applicable to each and every one of our 22 Alabama State Parks (as of October 17-19 I’ve added Cheaha to my tally) and their aggregate 74 square miles of beauty, magic, wonder, and awe. 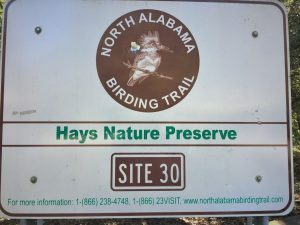 So, permit me to present the original Hays Nature Preserve and Big Cove Creek Greenway Blog Post here, and then offer an Addendum with similarly themed photos from five of our Alabama State Parks beneath the original. 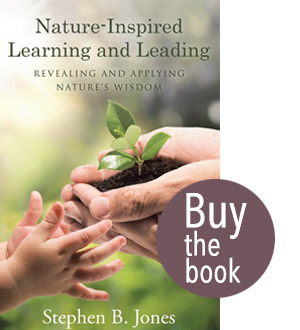 My second book, Nature-Inspired Learning and Leading, offers 13 primary lessons for life, living, and enterprise. Its first lesson applies to the way I approach living: Nature can serve as an essential life focus… and life force. I immerse in local Nature whenever I can. 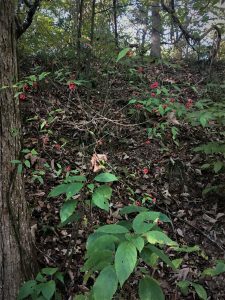 Judy and I participated with a hiking group Friday morning, October 12, 2018 at Big Cove Creek Greenway and Hays Nature Preserve, right in Huntsville, on the east side of Monte Sano Mountain. 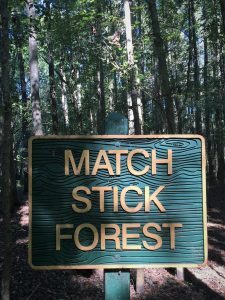 We enjoyed full Nature-immersion over a gentle five miles along Big Cove Creek and the Flint River. I’ve learned that Nature is where you seek it. We don’t need the Grand Canyon, The Olympic Peninsula, Yellowstone, New Hampshire’s White Mountains, or the Everglades to access A-level wildness… right where we live. Lesson five from that same book rings true: Nature provides multiple attractions for enhancing life’s journey… no matter where we are. 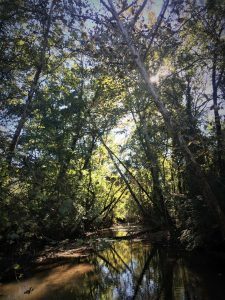 Big Cove Creek and Hays Nature Preserve furnished all the attraction necessary for an early fall immersion! The Greenway provides a paved surface along Big Cove Creek. We lived in Ohio along the Simon Kenton Rails to-Trail, giving us direct access to a network of ~250 miles of similarly paved surface. 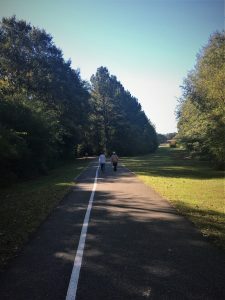 The greater Huntsville, Alabama area offers several paved utility rights-of-way trails that unfortunately do not constitute an interconnecting network. Yet these are wonderful wildland escapes within the otherwise urban and urbanizing landscape. Big Cove Creek Greenway offers plenty of shade even at mid-morning. 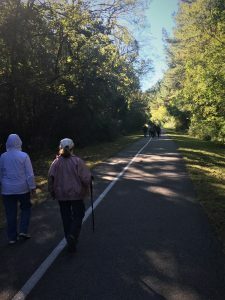 With fall at long last here in northern Alabama — we started the trek with light jackets! Our group focused on reveling in the sights along the way. That’s Judy at center; we had stopped to view some fall flowers trail-side. I like this Friday morning group because the participants are more interested in immersion than they are in racing from point-to-point. I tend to fall behind even the slow hikers — witness all the photos I stop to take. I find few lessons from Nature in simply logging the miles. Life’s far too short to focus on the destination — my competitive distance running days are far behind me. Deep forest and deep shade, even with some fall foliage-shedding already underway. 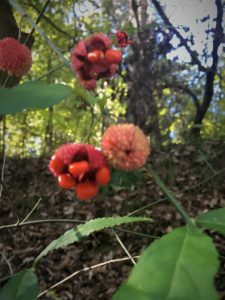 I could have developed a greater-depth Blog Post for only the Big Cove Creek Greenway… same for the other five segments of this week’s offering. Nature presents so much. I will fight the urge to digest and synthesize the detail. Again, I offer this Post as a broad sweep and overview. 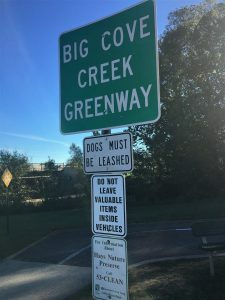 It’s named Big Cove Creek Greenway for a very good reason — this is Big Cove Creek. The Greenway is a paved and maintained utility (sewer line) right of way along the creek. 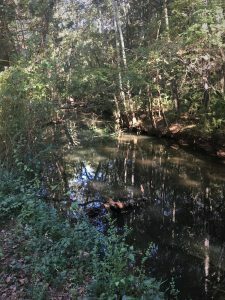 I am grateful for creeks, wetlands, and rights-of-way, without which many urban greenways and preserves might be sprouting houses instead of providing escapes to wildland! I’m told that this limited flow is typical of September and October, our two normally driest months. This late summer and fall have certainly met our low precipitation expectations. The stream flows lazily toward its imminent rendezvous with the Flint River, at this point less than a mile away. Then on to the Tennessee, the Ohio, the Mississippi, and the Gulf of Mexico. How infinitesimally small its contribution to the Mississippi’s average 600,000 cubic feet per second flow! Yet each small tributary, converging in aggregate, enables the Mighty Mississippi to reach exalted status among North American rivers. 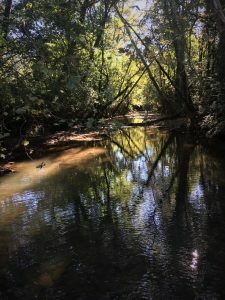 Our little Big Cove Creek does its work admirably… and serves its purpose with aplomb… through drought and deluge! I always enjoy a little humor tossed in to accent my Nature musings. Nothing beats good word play. How well I know — I wear people to exhaustion with puns and “grandad jokes.” No, not jokes aimed at grandads, but humor that only Pap can use to good end with our five grandkids. I like a well placed groaner! 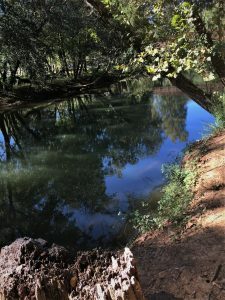 Here at Hays Preserve the Flint River stands only a small hierarchical stream-basin increment above Big Cove Creek in terms of scale and stature, especially during this seasonal period of light flow. Still, the Flint even during this dry period is at least an order of magnitude larger than Big Cove. 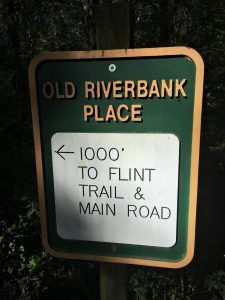 Regardless, who can dispute the beauty and serenity of the Flint reflecting a deep blue sky and quiet summer-green riparian forest canopy? 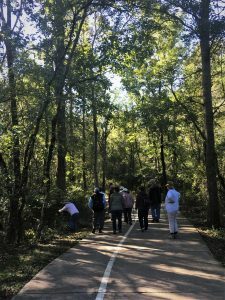 The Greenway led us to the Preserve: https://www.huntsvilleal.gov/environment/green-team/nature-preserves/hays-nature-preserve/. 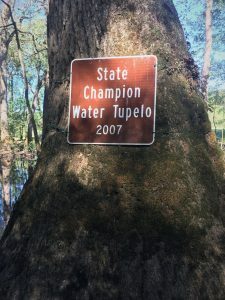 The site offers a brief description: The Hays Nature Preserve hosts several miles of paved trails that follow the Flint River and its associated oxbow lakes through low riparian habitat, old fields, and a golf course. And that, unsurprisingly, is what we encountered. Nice signage and an apparently flammable forest! I suppose there is some story behind the moniker. This is obviously at least second growth forest, regenerating after agricultural abandonment. Perhaps at some earlier stage of stand development the younger densely-stocked stand appeared to resemble match sticks. I’ll seek to find an answer. Back in my active forestry practice days we employed the term dog-hair thickets to describe young growth at very high numbers of stems per acre. An apt name. I commend the Preserve managers for effectively incorporating interpretive signage. I contend that we will properly steward this One Earth only if we are equipped with Nature-based wisdom and knowledge, and embrace a willingness to engage with passion and purpose in hard work on Earth’s behalf. Our actions and decisions must be informed. 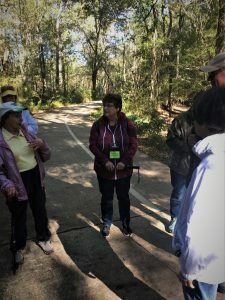 The Preserve is making an effort to inform visitors — my compliments! 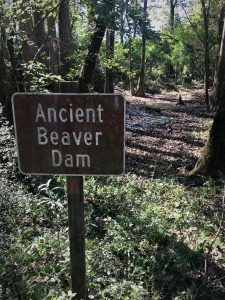 Although I did not see a brochure describing features like the Ancient Beaver Dam, I assume some such documentation exists. This one puzzled me with the term ancient. Beaver dams are of necessity ephemeral. They come and go as habitat ebbs and flows with inundation, death of the flooded forests, flushes and over-browsing of sprouts and brush. Eventually the beavers seek a new dam site, the original recovers, and the cycle goes on along the creek/river over time. I wonder what constitutes ancient. I’m approximating abandonment of this dam as within the past century, a time period that is nothing in the life of a stream… or to a species of stream-habitat rodent. From the internet: The beaver (genus Castor) is a large, primarily nocturnal, semi-aquatic rodent. Nature’s beauty, magic, wonder, and awe come in many packages. 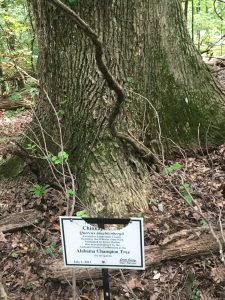 These two 15-18-inch diameter oaks serve as towering arbors for lush poison ivy (Toxicodendron radicans) and other vines I did not identify. The hairy vines of poison ivy eliminate any doubt about its identity — no leaves required. 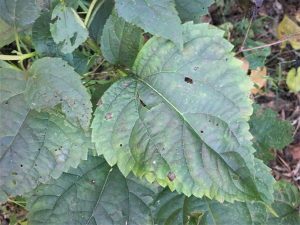 Interestingly, Poison ivy and wild grape, while capably of climbing fences, trees, and buildings, they seldom climb into the canopies of large trees from the ground. 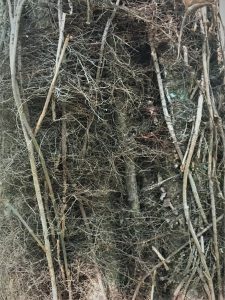 Instead, both grape and poison ivy, long-lived woody vines, normally accompany the seedling as it reaches vertically through sapling, pole, and mature sizes. The tree and vine grow in tandem. 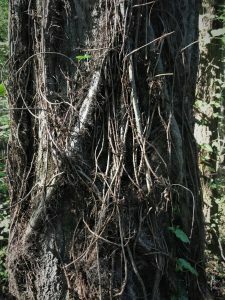 The vine relies upon the tree for aerial support. The tree must compete with its viney companion for sunlight and soil resources. I’m curious whether the tree takes some advantage from the relationship. Something for me to ponder and seek an answer from the internet. The more I learn about Nature… the less I really know. 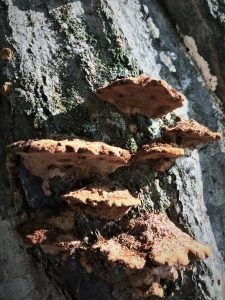 Burls are common in our southern hardwood forests. This oak burl is 8-10-inches in diameter. 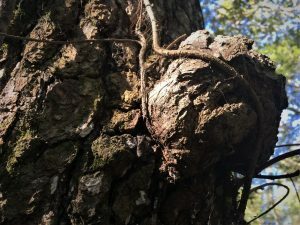 Burls are abnormal woody tissue often in the lower four-to-ten feet of the trunk, triggered by some stressors like fungus, virus, or physical wound. 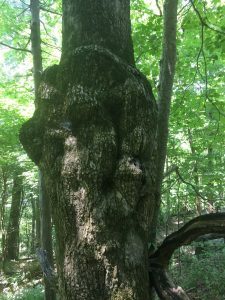 I’ve heard tree pathologists compare burls to a mammalian tumor. This one grew at some eight feet above ground, and is adorned with a lovely vine necklace. My guess is that within this burl, a beautiful turned wood-bowl awaits revelation by a talented eye, skillful hands, and a sharp lathe. 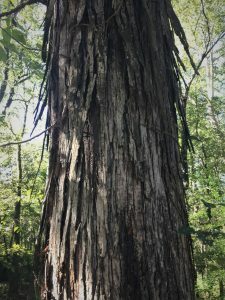 Even without vines, a shagbark hickory is a sight to behold. Who could not have named this species with such fidelity to appearance!? 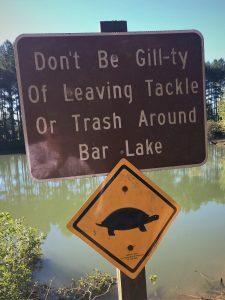 Perhaps as simple as some well-known and easily identified critters: cardinal; black racer; rattlesnake; snapping turtle; black bear. 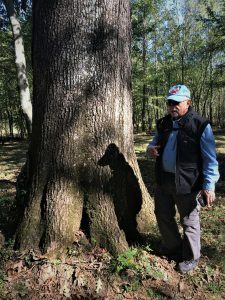 A thirty-inch-diameter white oak greeted us along the Flint River. Rich alluvial soils make for Mighty Oak anchorage. We also found Sugarberry (Celtis laevigata) on these floodplain soils. It’s a genera-cousin to common hackberry (Celtis occidentalis), which is ubiquitous along our north Alabama streams and rivers. 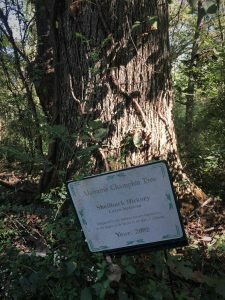 Hays Preserve boasts two state champion trees, including this shellbark hickory (Carya laciniosa). 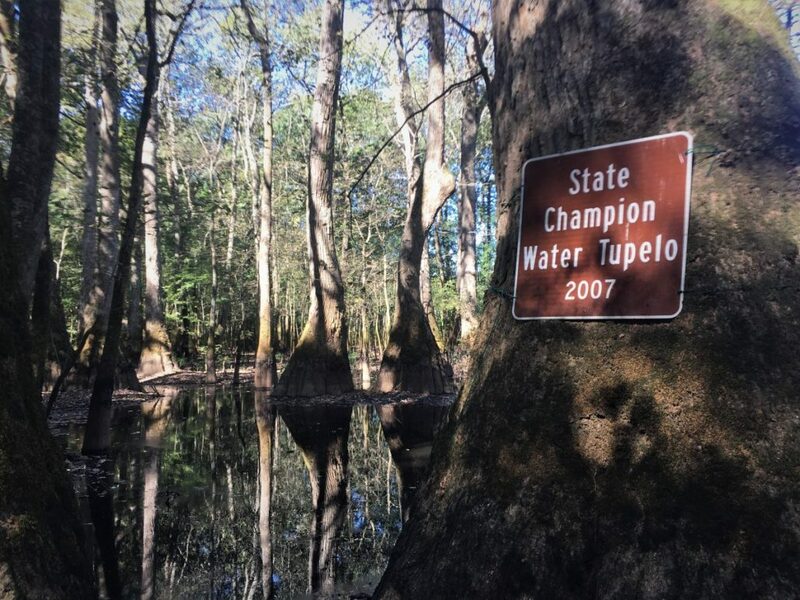 Whether Mighty Oak or shellbark hickory, nothing beats these riverine sites. Same for this state champion water tupelo (Nyssa aquatica), which prefers wetter feet, found commonly in sloughs, oxbows (like this one), and in slack-water along streams. 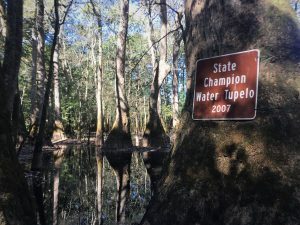 Life flourishes along Big Cove Creek and the Flint River. And anywhere that life is full, death is nearby and concomitant, for there is never one without the other. 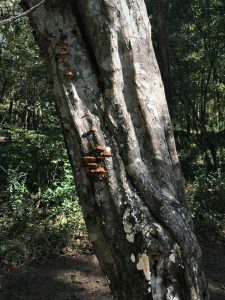 Too far gone for to identify species, this tree is inexorably returning to the soil… courtesy of micro-organisms and invertebrates, and aided by birds and small mammals excavating the buffet of tasty edible grubs and insects. 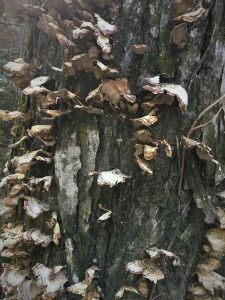 Not nearly so completely decayed, this still-standing dead shagbark hickory has caloric content sufficient to satisfy the most discriminating fungi. 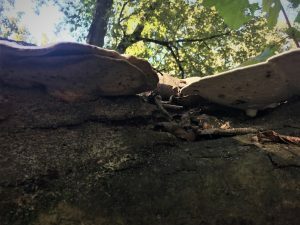 I’ve noticed that there is a distinct threshold beyond which decaying wood no longer bears fungal fruiting bodies (mushrooms). 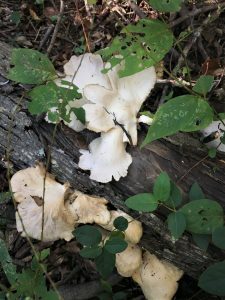 I’m sure that mycologists have carefully determined that threshold by region, type of tree, and mushroom species. 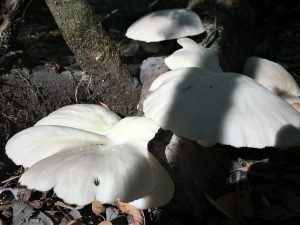 There are those readers able to identify the following portfolio of mushrooms. Remember, I am a tree guy who is re-discovering every day how little I know about so much! 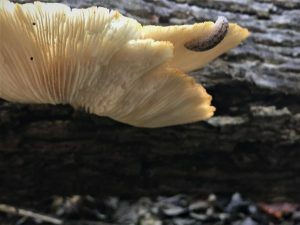 Here’s a six-inch diameter, fallen hickory providing nourishment to a fungus with lovely mushroom. 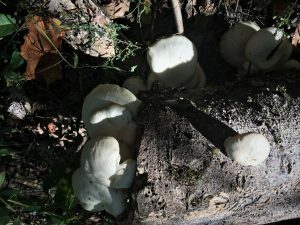 We hiked at just the right period, encountering many fresh ‘shrooms. 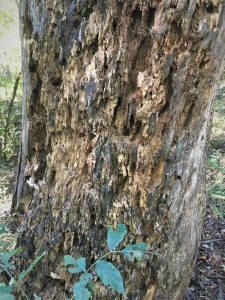 The left fork of this twin musclewood tree (Carpinus carolinia) yielded to death while its right side remains vibrant. 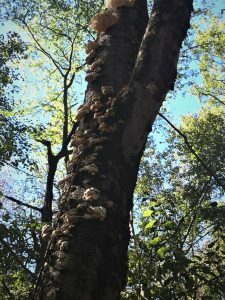 The left side is rich with saprophytic life. 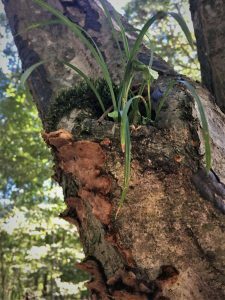 An old hollowed branch stub even serves as pot for some grass and a broad-leafed plant. 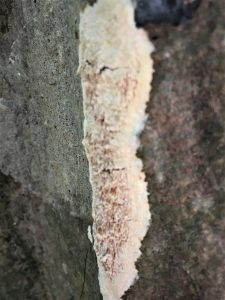 I believe (not at all certain) that the lower left organism is a crustose lichen. 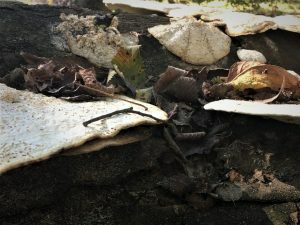 Lower right is a form of shelf mushroom — a conk. Both seem quite content on the dead musclewood. 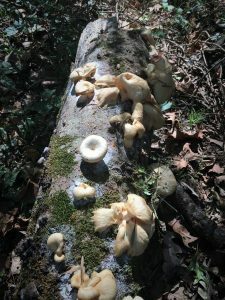 Downed Sugarberry sported lots of fresh fruiting bodies, again evidencing that our timing was good. Some day I will be better equipped with knowledge about these essential organisms that signal the interplay of life, death, and ecosystem vitality and renewability. A vibrant fallen Sugarberry log community along the Flint! And more Sugarberry recently fallen from a dead standing snag. From the same topped Sugarberry. 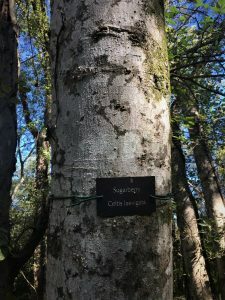 And this is the 12-foot Sugarberry snag whose crown furnished the colonized fallen pieces above. Again, the cycle of life and death and life spins without end. Spring ephemeral wildflowers are my ken, yet in this life-stage I term semi-retirement I am blessed to extend my seasons. I’m finding reward in paying heed to our fall flowering friends. 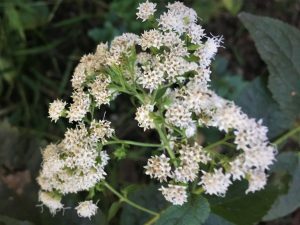 Here’s white snakeroot (Ageratina altissma) along the Greenway. Were this open in April, I would declare it extraordinary. My enthusiasm requires a higher threshold in October. However, once I stopped to admire and photograph, I gave it high marks. Leaves and branching structure for those who want more detail. 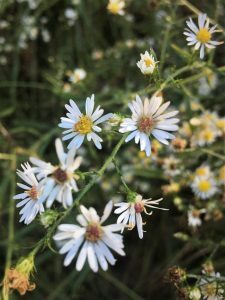 White Heath Aster (Aster pilosus) is another that I would have paid scant attention to in prior years. Yet, upon closer inspection, it’s now a winner. I am becoming a believer in fall’s floral splendor. I’m looking…. seeing… and feeling. There’s much to be appreciated in the rapidly waning summer. The kind of beauty I ache to see in early spring is hidden now within plain sight. I had simply failed to notice. Wild Sensitive Plant (Chamaecrista nicititans) continues to flower trail-side. I’ve been seeing it at various locations for some six weeks. 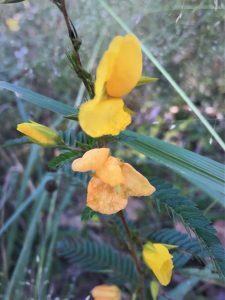 Until I just checked my reference book to confirm Latin name, I had been calling this plant Partridge Pea, which it turns out is of the same genus, but has five uniform petals. 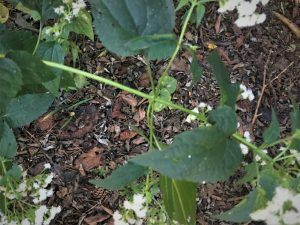 Wild Sensitive Plant has irregular petals. I’m learning, seeking a knowledge assimilation pace greater than my information ablation rate! The battle is tightly contested. 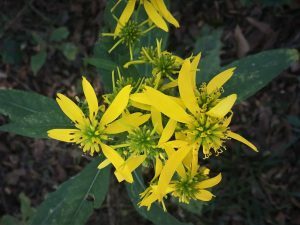 Another species attracting our attention — Wingstem (Verbesina alternafolia). 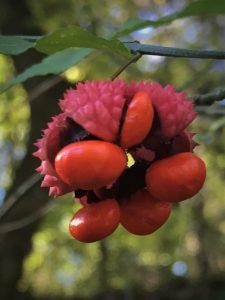 Although a fruit and not a flower, Heart-a-Bustin (Euonymus americanus) rivals the beauty of any showy flower. 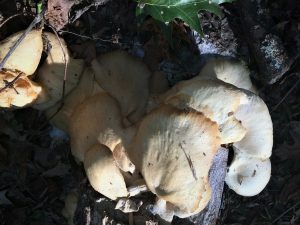 What a gift to find trail-side! Like most such beauties, the gift is best observed up close and personal. 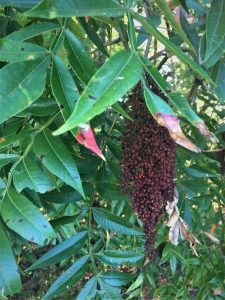 Another fruit, this Winged Sumac (Rhus copallinum) seed head adds a splash of fall color. The winged moniker draws from the flanged compound leaf stem between the leaflets. See lower right photo. 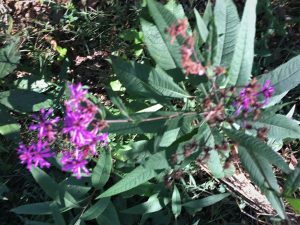 We’ll end with ironweed (Vernonia gigantea), in flower locally since August, which may be another explanation for my spring ephemeral bias. Spring species flowering windows are so much shorter. Skip a weekend and the freshet of display has already headed north. Skip a couple weeks late summer and we miss nothing! 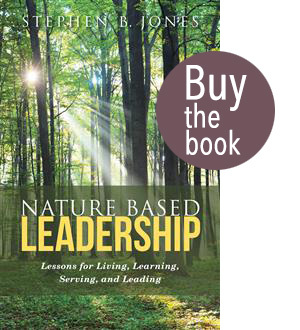 Nature can serve as an essential life focus… and life force. Nature provides multiple attractions for enhancing life’s journey… no matter where you are. 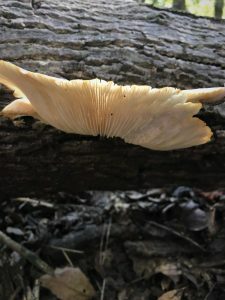 And from my opening for this Blog Post, I’ve learned that Nature is where you seek it. We don’t need the Grand Canyon, The Olympic Peninsula, Yellowstone, New Hampshire’s White Mountains, or the Everglades to access A-level wildness… it’s right where we live. What’s near you… within your reach? Are you treating yourself? Enjoy your autumn — cherish Nature wherever you are. Nature is a smorgasbord; may you be hale and hearty in her embrace! 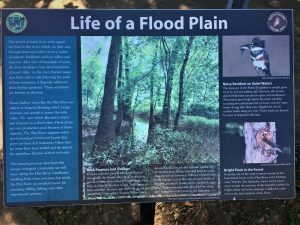 View this photo and brief text as postscript to this Hays Preserve and Big Cove Creek Greenway Post. 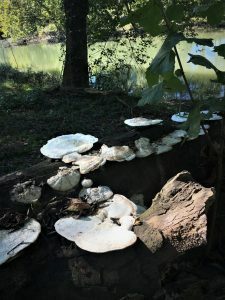 I will remain true to the themes of Nature as an essential life force and focus, and Nature providing multiple attractions for enhancing Life’s journey… no matter where you are. 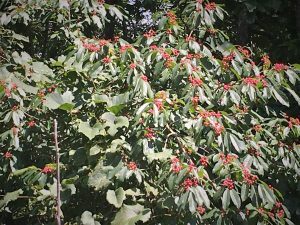 Here’s a late August Monte Sano State Park photo of a spice bush (Lindera benzoin) in full fruit. 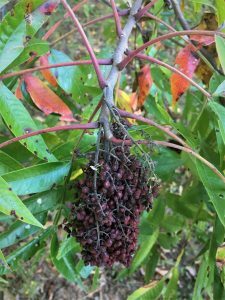 Like the winged sumac and Heart-a-Bustin fruits along Big Cove Creek Creek and the Flint River, Spice-bush strives for beauty well beyond its spring flowers. 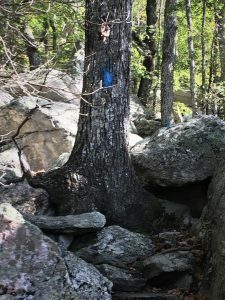 And from Cheaha, a steep segment of the Lake Trail ascending 1,200-feet vertical from the lake to the summit. 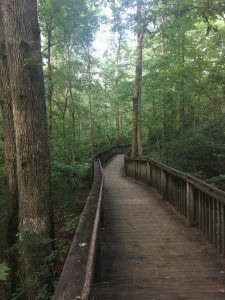 A trail that tested these old knees in ways far different from our paved Greenway hike along Big Cove Creek and the Flint River! Nature varies the seed according to the variety of the things she desires to produce in the world.